California beaches are culturally, economically, and ecologically important. Significant health risks and economic losses are associated with bacterial pollution at California beaches. Recent improvements in treatment and disposal have reduced coastal pollution from offshore sewage outfalls, and contamination in many urban locations during dry weather is primarily runoff that drains directly onto the beach, or from tidal flushing of contaminated creeks and estuaries. The transport and mixing of these pollutants by ocean waves, currents, and tides are poorly understood. The goal of the proposed Imperial Beach Pollutant Transport and Dilution Experiment (IB09), is improved understanding and modeling capability of breaking wave-driven transport and mixing of pollutants in the nearshore at alongshore distances of up to O(5-10 km) from a surfzone source. The focus is on dry-weather conditions, when the Tijuana River flow is very small, and beach usage is maximum. Increased understanding of surfzone transport and dilution of observed tracer (dye and chlorophyll) concentrations will allow improved modeling of the fate of pollutants discharged directly into the surfzone. A tested and calibrated surfzone tracer dilution model will be an important tool for managing beach closures in California. The wave-driven dilution and transport measurements will be enhanced with an intensive biological sampling program in order to better understand the physical and biological dynamics governing bacterial and phytoplankton patchiness in the shallow nearshore waters. Wave and current nowcasts of the experiment site will also be tested and numerical model predictions for the region will be available through the Coastal Data Information Program (CDIP) web site for use by beach managers, sanitation districts, and county health agencies. 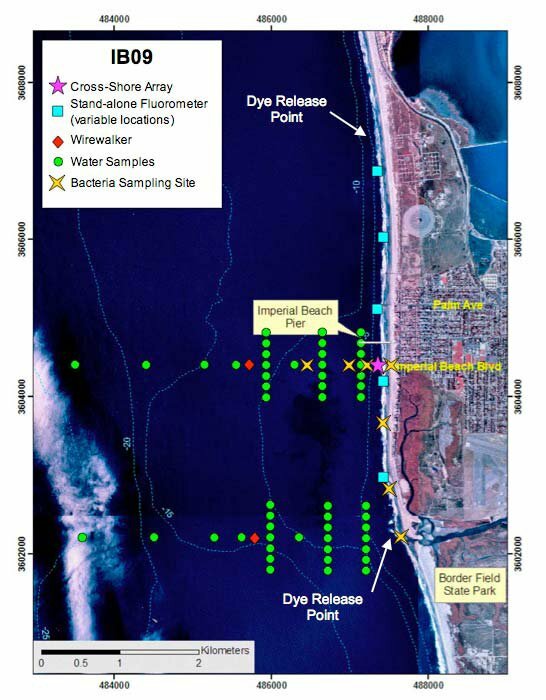 The experiment site is on and offshore of Imperial Beach between the Tijuana River to the south and the Silver Strand to the north (Figure 1), a site selected for its long straight coastline and a history of water quality problems. The experiment will take place from about September 8, 2009 through October 31, 2009. Deployment of the fixed instrument cross-shore array will begin September 9, 2009 and will take approximately 7-10 days. Data collection will last for approximately 1 month. Retrieval of the instruments will take about 1 week depending on wave conditions. The mixing and transport of pollutants by breaking wave-driven process will be studied through a series of dye tracer experiments. Dye released at selected locations at the shoreline under different wave conditions will be carried by the prevailing alongshore currents to form a plume (Figure 2). Wave, current, tracer, bathymetric, and biological measurements, obtained with instruments and techniques described below, will be used to track the plume and rate at which it widens and dilutes. During south swell conditions (i.e., northward dominated currents) dye will be released just north of the Tijuana River mouth. 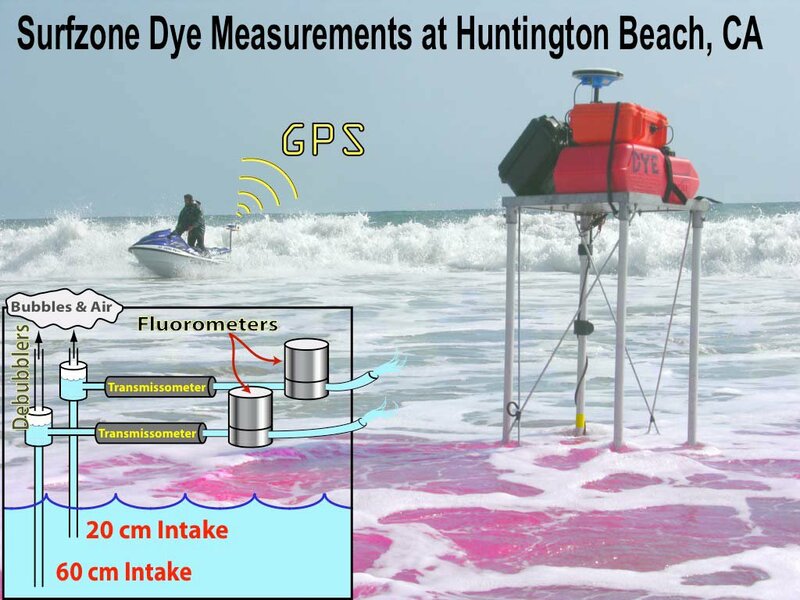 During north swell events (i.e., southward currents) dye will be released at the northern limit of the experiment site south of the Silver Strand State Beach. Pressure sensors, temperature sensors, current meters, and fluorometers (measuring fluorescence from dye or chlorophyll) will be mounted on tripod frames anchored to the sea bottom on a cross-shore transect between the shoreline and about 5-m depth (Figure 3). The cross-shore array of tripod frames will be located offshore of Imperial Beach Blvd. These instruments will remain at this fixed location for the duration of the experiment. Four to six stand-alone fluorometers attached to pipes or poles anchored to the sea bottom will deployed in the surfzone at various alongshore positions during dye experiments. These instruments will be monitored during operation, and removed after each dye experiment. Dye released several kilometers updrift of the cross-shore array will be carried by the wave-driven alongshore current towards the fixed instruments. Instrument locations will be marked by fiberglass poles and/or flags that protrude above the water surface (Figure 3). Warning signs will be posted along the shoreline onshore of the instrumented area. A unique jetski sampling system (Figure 4) has been developed based on an existing jetski bathymetry surveying system. The sampling jetski includes GPS (global positioning system) to fix the jetski location, a boom with two water intakes (at 20 and 60 cm depths) for sampling, and sensors for measuring temperature, conductivity, turbidity, and fluorescence (dye or chlorophyll concentrations). This new sampling system allows near-synoptic surface maps of the sampled properties to be produced in the nearshore region and across dye or river plumes. The jetski can sample at speeds of 4-5 m/s. Two continuously profiling wirewalkers (CTD+F, currents) and ADCPs will be moored in 10-15 m water depth. Continuous measurements of the currents, temperature, salinity, and chlorophyll fluorescence structure at these locations will provide insight into the internal wave field and subsurface chlorophyll gradients. Daily small boat surveys will map current, temperature, depth, fluorescence, and nitrate on cross- shore sections between the shoreline and about 40 m depth. In-situ water samples will be collected throughout the experiment at the shoreline and offshore using a small boat. Water samples will be filtered and chlorophyll extracted in acetone, and whole water samples will be preserved in formalin for laboratory enumeration and taxonomic identification of phytoplankton genera. 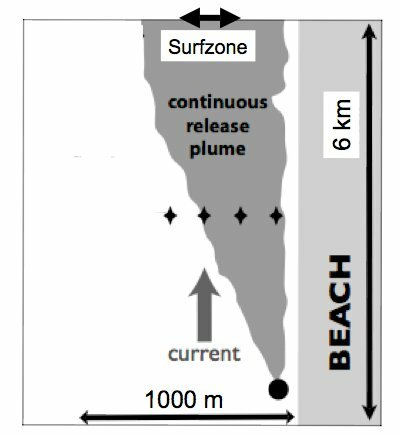 During the dye studies approximately 15 surfzone drifters (Figure 5) will be repeatedly released/retrieved/reseeded along the 6 km long experiment site. The drifters follow the water, and will be used to measure the surfzone circulation. The drifters are harmless to bathers and surfers. 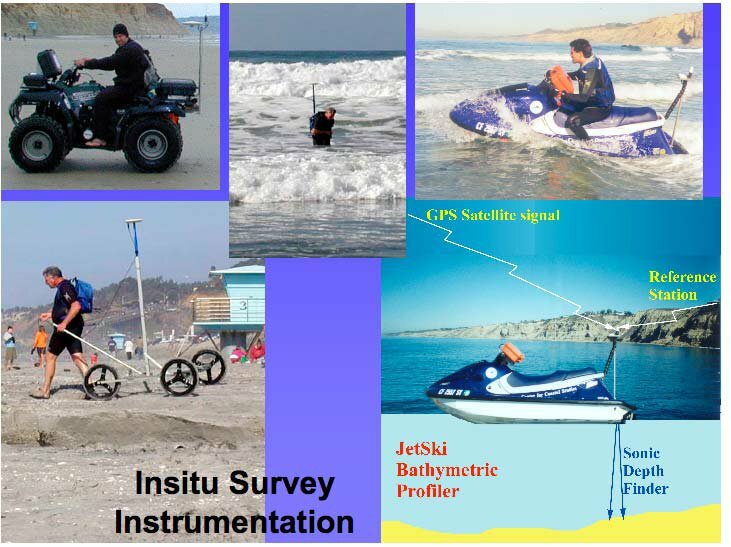 Surveys of the beach and offshore bathymetry out to about 8 m depth will be made using various in situ survey instrumentation (Figure 6) as described below. Sub-aerial beach sand level surveys from the back beach to the waterline will be conducted at low tide with a GPS-equipped all terrain vehicle (ATV). ATV surveys are made by driving on alongshore-oriented (parallel to the shoreline) transects spaced about 10 m apart. ATV surveys need to be conducted at low tide which may occur at night. A Jetski equipped with a GPS and Sonic Depth Finder will be used to survey the underwater bathymetry seaward of the surfzone to about 8 m depths. Surveys will be conducted at high tide and are made by driving the Jetski on cross-shore oriented (perpendicular to the shoreline) transects spaced about 100 m apart. Jetski surveys are conducted when waves are low (< 3-4 feet) and are never conducted at night. 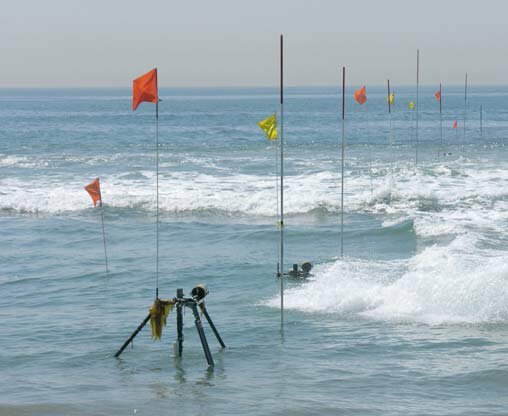 We have successfully conducted nearshore experiments with in-the-water instrumentation at Torrey Pines State Beach (1977, 1996), San Onofre State Beach (1993), La Jolla Shores Beach (2000, 2001, 2002), Scripps Beach (numerous times), Blacks Beach (2003), and Duck, North Carolina (numerous times), and most recently at Huntington State Beach (2006). 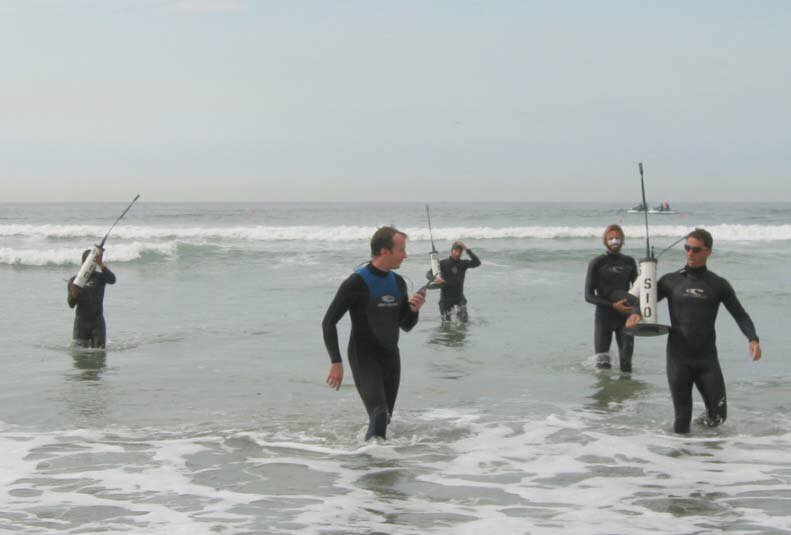 Additionally, since April 2001 we have been conducting regular all-terrain-vehicle (monthly) and Jetski (quarterly) sand level surveys at numerous sites in San Diego County (e.g., San Onofre, Camp Pendleton, Cardiff, Solana Beach, Torrey Pines Beach, and Tijuana River Estuary). In each case, we have cooperated with, and received cooperation from State Parks and City staff and lifeguards. In each case, we have completely removed all traces of the experiment when it is over.